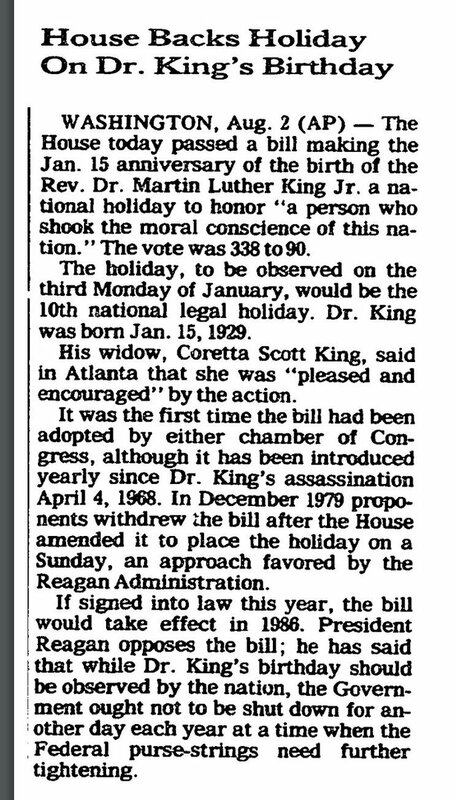 Reagan didn't sign "the order creating the Dr. Martin Luther King national holiday"-he resisted demands from Dems for a federal MLK holiday, said it was too costly & be inappropriate, & let Senate republicans filibuster before buckling to political pressure & signing the bill. 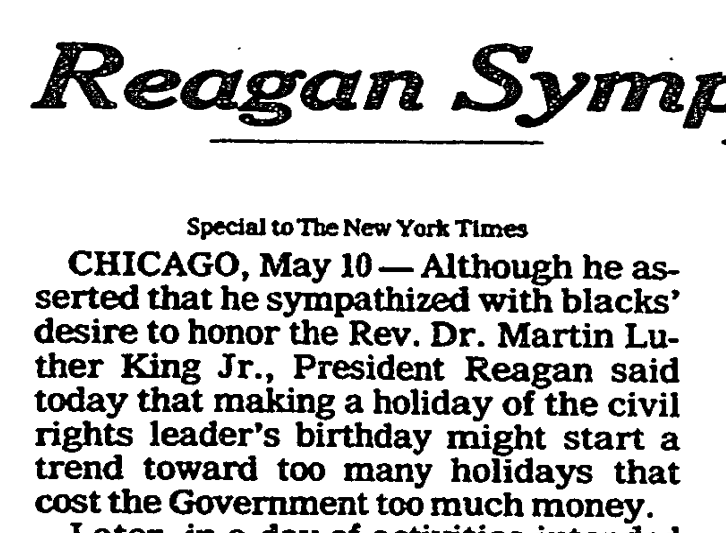 May, 1982: Reagan was sympathetic, but it's a slippery slope to too many federal holidays! Churchill used this line (mangled here, obvs) in the election of '45, charging the folks he'd run the anti-Nazi war effort against as no different from Nazis. Anyhoo now everyone in the UK's had affordable healthcare for nearly three-quarters of a century, the British empire stopped oppressing the rest of the world, and there's no English Gestapo. There remains a persistent inability for many Americans to reckon with what “nationalism” is & *why* countries with strong nationalist movements proved so succeptible to fascism post-WWI. Nationalism isn’t just “I super ❤️ my country.” It’s a story of who belongs & who doesn’t. A "nation" is a group of people-as Benedict Anderson famously described, an "imagined community." Nationalism is not an ancient form of political & social identity; instead it arose after the French Revolution. Since the breakup of the western Roman empire, Europe had always been divided into ever-changing polities--kingdoms, city-states, empires, principalities--governed by ever-changing rulers. LI's overt racism and xenophobia has been well & rightly critiqued, and @KevinMKruse and @studentactivism (I'm sure among others) have noted the dark historical parallels here. But I was struck by another part of her comments, the "none of us ever voted for" part. @KevinMKruse @studentactivism Well, LI is not a member of Congress. And Congress has indeed voted on immigration law, the modern foundation of which dates to 1965. The crowd that is always crowing about "WE'RE A CONSTITUTIONAL REPUBLIC NOT A DEMOCRACY" should know they don't get a vote on everything. @KevinMKruse @studentactivism LI didn't vote on the constitution either, or any other number of laws that go back to the 18th or 19th centuries but are still on the books. They are still part of our system of government. Obviously, no contemporary American history textbook fails to point out Jim Crow was a product of the Democratic south. More importantly, D’Souza (mis)uses the work of James Whitman to distort American-Nazi legal relations, as anyone who’s read the book would recognize. As reported in the article D’Souza himself links to, he claims to draw from Whitman the influence of American racial law on Nazi Germany, the subject of Whitman’s much-praised Hitler’s American Model. D’Souza focuses on Whitman’s evidence that there were elements of American racial laws viewed as too extreme even for the Nazis—to be understood as ‘the Democrat party was too extreme for Nazis! Can you believe it?’ Well, that’s not quite Whitman’s claim. The thing about God and Man at Yale is.. it’s terrible. It’s clearly the work of a novice writer with a polemic to make—facts, nuance, and context be damned. It doesn’t just attack ideas but indicidual people, & caricatures them mercilessly. It ends with an appeal to conservative trustees to rein in the supposedly communist faculty (they were not, in fact, communists). No wonder it was denounced by actual academics. But that, of course, is the perpetual trap laid by conservative populists. Actual intellectual critique—as D’Souza knows so well—is only further proof for readers of the original thesis. It’s not a debate on the level. It's presented as if memories of the Holocaust are getting worse, but without actually citing any (any!) evidence that this might be the case. Today begins Women's History Month, and @eiwhalen threw down a challenge to #twitterstorians to tweet daily about a woman who made history. So here begins my thread for the month -- others, please join in! 3/1: In class today I taught Charles Payne's extraordinary _I've Got the Light of Freedom_ so I'll start with ELLA BAKER, the grassroots community organizer with the NAACP, SCLC, & SNCC, who fought the freedom struggle by tirelessly teaching participatory democracy. The Civil Rights Movement would have been very different & likely less effective, without her work. Ms. Baker didn't have much faith in charismatic leaders or centralized institutions, but faith in communities learning how to to collectively advocate their interests. I will wade in here not to take a position on GG but as an historian. I’ve said this before, but saying mean things on Twitter and alleging Russia connections does not equal the new McCarthyism, and in fact, perpetuates a massive misperception of what the Red Scare was. The fact that GG is employed and has a prominent public voice should be enough of a clue that something is different. McCarthyism—the Red Scare, which we often identify w/the senator from Wisconsin but whose power came more from the House’s HUAC committee and (as GG suggested) the FBI—was a political movement within government to punish political activity & even political thought. Here @DineshDSouza is trying to tie the 1920s Klan to Democrats and the real photo literally ties them to racist police.